I’m incarcerated at home at the moment, having been laid low with a seasonal Yuletide dose of coughing and spluttering so I haven’t been out observing, photographing and recording. Consequently, this is an ‘armchair post’ using old photographs, and constructed in the warmth of my dining room. It has been inspired by the superb book ‘Corvus‘ by Esther Woolfson which describes living with many different birds including a rook and a magpie. If you haven’t yet read ‘Corvus‘, insist on a copy as a stocking filler this Christmas. It’s a beautiful book and is beautifully observed and written, one of the best nature books I’ve ever read. It’s very informative, funny and thought provoking and has led me to ponder the enduring relationship between humans and our wild creatures. Henry VIII didn’t stop there, he also passed the ‘Sumptuary Law’ of 1510, to be updated several times under Elizabeth I and known collectively as ‘The Statutes of Apparel’, which governed what could be worn by which social strata thus establishing a dress code regarding furs. Royalty could wear ermine and substrata of nobility could wear fox, otter etc… . Open season was thus declared on all furry animals. However, and it is a big however, it is very easy to sit in the comfort of our centrally heated houses with our cars and our convenience stores, and pass glib judgement on people of those times. In the 16th century many harvests failed, early death from disease was a ubiquitous presence in the lives of all people, rich and poor, and one way to stave off such a fate was to eat healthily. Anything which threatened the food supply was therefore deemed vermin to be exterminated. Religious factors also played a part, e.g. the otter’s diet was predominantly fish so their flesh was deemed by the church to be sufficiently fishy to be eaten for religious reasons instead of fish. God help the otter. The Vermin Acts were repealed in the mid 18th century but the practices they enforced only started to abate in the early to mid 20th century. That reflects a blood lust in humans which is anachronistic and indicative of a deeply unpleasant side of human nature that in our more enlightened times one may hope would find an outlet in other, more civilised, pursuits. So it is infinitely less problematic to pass judgement on the contemporary activities of hare coursers, badger baiters, egg collectors and misguided land stewards who still trap, poison and shoot red kites… or hen harriers etc., etc..
Back to crows, I have never subscribed to the point of view that members of the crow family are malevolent, wantonly destructive, or the harbingers of doom, as popular culture has historically portrayed them. And they certainly didn’t merit the attempts at wholesale extermination decreed for them in Tudor times. I have often watched a couple of hundred rooks assemble in the mornings over Histon church amidst much cawing and general hubbub prior to disappearing en masse either as one, or in several smaller groups to feed in the local fields. I’ve also watched them wheeling in the air, playing tag, and indulging in what can best be described as pure devilment with their fellows and with other species of birds. They seem to possess a keen intelligence probably essential for a creature which lives socially in very close proximity to hundreds of others. 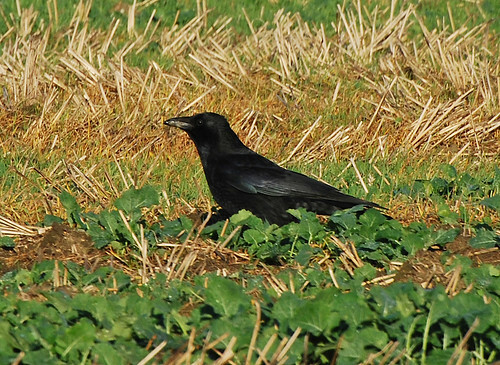 The habit of all members of the corvid clan of caching food items, and then re-caching an item if they know they were watched first time round, indicates they have self awareness, awareness of others and coherent notions of the intent of others, and the ability to plan accordingly. And of course a very impressive memory. 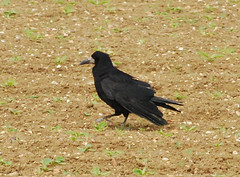 It has also been demonstrated from a neuroanatomical standpoint that corvids have a high ‘encephalisation quotient’ – ratio of brain to body size – which renders them capable of higher levels of brain activity and I think that is adequately demonstrated by just watching them for a short time – 10 minutes observation has been enough to convince me on some occasions. ‘Bird brains’ they certainly aren’t! The key point, it seems to me, is that scientific elucidation of relative intelligence levels between species is a somewhat redundant enterprise in many ways except than as part of an effort to change human perception, and hopefully educate people that random massacre of wild animals is not acceptable. I find it bizarre and shameful that it has ever been considered a reasonable occupation by humans to slaughter billions of animals for no particularly good reason. It is incumbent on all species to share our surroundings with each other in order to maintain a functioning and healthy place which we can justly claim to have managed in a sustainable way. Blimey, there we are. Nothing like a dose of flu to catalyse a bit of pre-Christmas moralising. But I think if everyone were to read Esther Woolfsons ‘Corvus‘ it may impart a deeper understanding and respect for our fellow creatures in many more people. I think attitudes to other creatures are changing as the enormous amount of available information is accessed by people all over the world, but preserving wildlife will be a perpetual process as wildlife is squeezed into smaller and smaller pockets of true wilderness. I hope we can find a working balance. 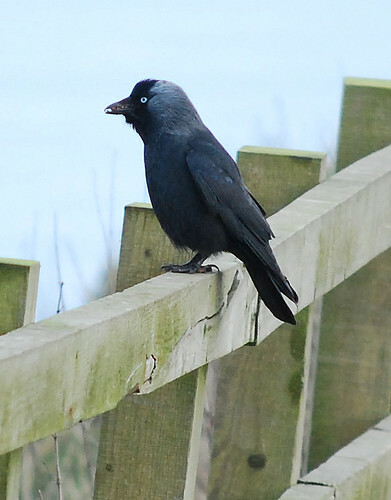 This entry was posted in Birds and tagged birds, carrion crow, corvid, Corvus, crow, Esther Woolfson, jackdaw, Nature, rook, Vermin Acts, wildlife. Bookmark the permalink. What a great post, full of information, smooth writing style. Hello Beeseeker, you’re very welcome. Thanks for your nice comment! argylesock says… Under the Tudor kings and queen, people were paid to kill wildlife classed as vermin. Those 16th century laws were repealed 200 years later but for some of the species which had been persecuted under those laws, populations still haven’t reached their former levels. Some of those are species we now value and conserve. Thanks for the reblog Sam. I think I would like to read that book. I love corvids and always consider it a privliege to see them. I don’t know quite why, but they’ve always seemed very special to me. I know they’re intelligent because I’ve watched them extract the food from inside a fat ball net using their feet and beaks to prise the food out. I feel huge respect for them and certainly count them among my favourite birds. Thank you for such a thought-provoking post. It’s essential reading for a corvidophile. Esther Woolfson is from your corner of the UK and the book is set mainly in Aberdeen. It’s a lovely read. If you get a copy please let me know what you think.